Background: Recently, single port access laparoscopic surgery can be considered to have an attractive cosmetic advantage especially in transumbilical approach with its innovative features. Many encouraging studies have been reported regarding clinical application of transumbilical single access laparoscopic surgery (TSALS) in various field of gastroenterological surgery, such as colectomy and gastrectomy. Our previous cases of TSALS for cholecystectomy and appendectomy have provided safe and feasible of our novel technique using reusable metallic screw-type trocar. In this case series, we extended the indication of TSALS for appendectomy (TSALS-LA) to complicated acute gangrenous appendicitis. We report 4 consecutive cases of TSALS-LA and discuss the therapeutic aspects of this entity. Patients and methods: From March of 2010, 4 consecutive patients with acute gangrenous appendicitis were assigned to undergo TSALS-LA at our hospital. The purpose of this study was to describe the outcomes of TSALS-LA with our novel technique using reusable metallic screw cannula for complicated acute gangrenous appendicitis. We conducted to study our technique using reusable metallic trocar (ENDOTIPTM, 6mm in diameter, 65mm, 105mm in length, KARL STORZ GmbH & Co. KG, Tuttlingen, Germany) as a working port. XCELTM (5mm in diameter, 100mm in length, ETHICON ENDO-SURGERY, INC., Pittsburgh, PA, USA) was used as a camera port. Straight-type grasping forceps and dissecting forceps in different length were used in the parallel setup. All patients were diagnosed as complicated acute appendicitis with local peritonitis pre- or intra-operatively. Peritoneal irrigation with more than 5 L of standard saline was completed in whole abdominal cavity using high-pressure irrigation system. 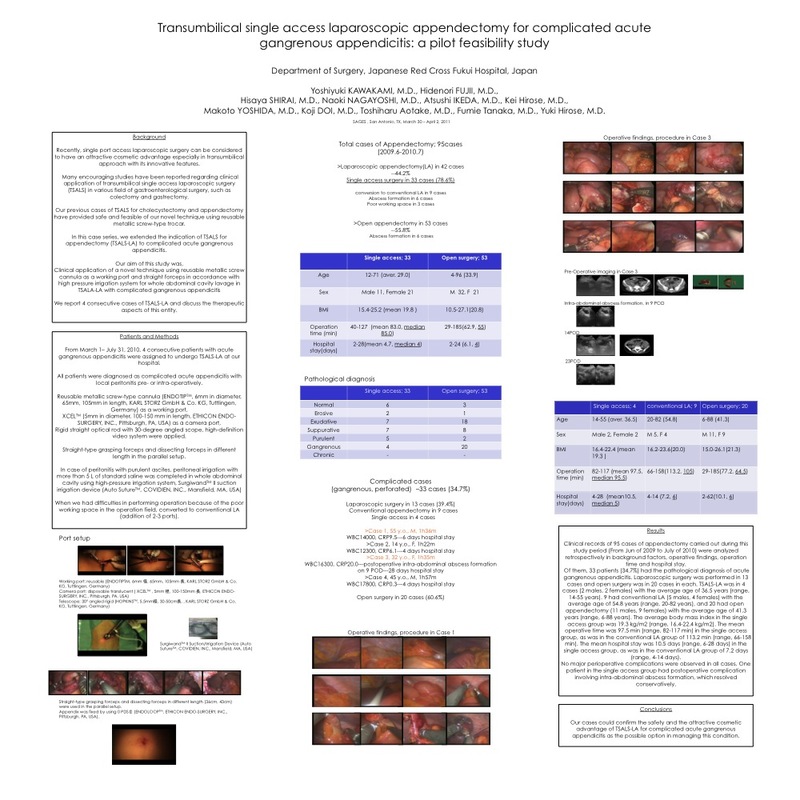 Results: Clinical records of 95 cases of appendectomy carried out during this study period (From Jun of 2009 to July of 2010) were analyzed retrospectively in background factors, operative findings, operation time and hospital stay. Of them, 33 patients (34.7%) had the pathological diagnosis of acute gangrenous appendicitis. Laparoscopic surgery was performed in 13 cases and open surgery was in 20 cases in each. TSALS-LA was in 4 cases (2 males, 2 females) with the average age of 36.5 years (range, 14-55 years). 9 had conventional LA (5 males, 4 females) with the average age of 54.8 years (range, 20-82 years), and 20 had open appendectomy (11 males, 9 females) with the average age of 41.3 years (range, 6-88 years). The average body mass index in the single access group was 19.3 kg/m² (range, 16.4-22.4 kg/m²). The mean operative time was 97.5 min (range, 82-117 min) in the single access group, as was in the conventional LA group of 113.2 min (range, 66-158 min). The mean hospital stay was 10.5 days (range, 6-28 days) in the single access group, as was in the conventional LA group of 7.2 days (range, 4-14 days). No major perioperative complications were observed in all cases. One patient in the single access group had postoperative complication involving intra-abdominal abscess formation, which resolved conservatively. Conclusions: Our cases could confirm the safety and the attractive cosmetic advantage of TSALS-LA for complicated acute gangrenous appendicitis as the possible option in managing this condition.